Contingency planning can be defined in a number of ways. The National Institute of Standards and Technology (NIST) defines contingency planning as management policies and procedures designed to maintain or restore business operations, including computer operations, possibly at an alternate location, in the event of emergency, system failure, or disaster. The Information Technology Infrastructure Library (ITIL) defines disaster recovery as a series of processes that focus only upon the recovery processes, principally in response to physical disaster, that are contained within business continuity management (BCM). The Department of Health and Human Services (HHS) Enterprise Performance Life Cycle (EPLC) defines a contingency/disaster recovery plan as the strategy and organized course of action that is to be taken if things don't go as planned or if there is a loss of use of the established business product or system due to a disaster such as a flood, fire, computer virus, or major failure. Although contingency planning sometimes is thought of as an Operations and Maintenance Phase activity, contingency measures should be identified and integrated at all phases of the project life cycle. NIST defines a seven-step contingency planning process to developing and maintaining a viable contingency planning program. These seven progressive steps are designed to be integrated throughout a project's life cycle and help guide stakeholders in the planning, development, implementation, key success factors, and maintenance of contingency plans. Identify any specific regulatory requirements related to contingency planning. Develop a formal contingency planning policy statement that provides stakeholders the authority and guidance necessary to develop an effective contingency plan. Obtain executive approval, and publish policies such policies. Conduct a business impact analysis (BIA) to identify and prioritize critical systems, business processes, and components. Include impact of events, allowable outage durations, and recovery priorities. Identify and implement preventive controls and measures to reduce the effects of disruptions, increase availability, and reduce contingency costs. Develop recovery strategies ensuring critical systems, business processes, infrastructure, etc can be recovered quickly and effectively following a disruption. Integrate them into system architecture. Develop contingency plans containing detailed guidance and procedures to recover from disruptions. Plan testing, training, and exercises to reinforce, validate, and test contingency plans to identify gaps and to prepare recovery personnel for unforeseen events. Document lessons learned and incorporate them into updates to contingency plans. Maintain contingency plans as living documents. Update them regularly to reflect changes in any influencing factors. Business Continuity Plan – part of the Certification and Accreditation process, focuses on sustaining business functions during and after a disruption. May address all key business processes or be developed for a specific business process. 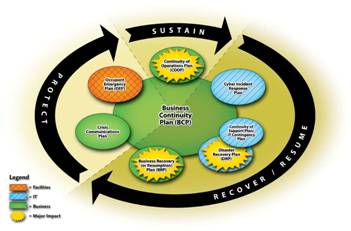 Business Recovery Plan – focuses on restoring business processes after an emergency. Continuity of Operations Plan – mandated by Presidential Decision Directive (PDD) 67, Enduring Constitutional Government and Continuity of Government Operations, focuses on restoring essential functions at an alternate location and performing them for some time before returning to normal operations. Continuity of Support Plan – required by the Office of Management and Budget (OMB) Circular A-130, Appendix III, focuses on the capability of continuing support and service provided by major applications. Crisis Communications Plan – focuses on defining structures and methods focused on public outreach including procedures for collecting, screening, formatting, and disseminating information. Cyber Incident Response Plan – focuses on defining procedures to address cyber attacks. Disaster Recovery Plan – focuses on defining procedures to recover from catastrophic events that deny access to normal operations for an extended period of time. Occupant Emergency Plan – focuses on providing response procedures for occupants of a facility in the event of a potential threat to the health and/or safety of personnel, environment, or property. During requirements gathering, identification of very high system availability requirements may dictate that redundancy, real-time monitoring, and fail-over capabilities be built into the project's product. During product development it's feasible that redundant communication paths, power management systems, load balancing, data mirroring, and replication may need to be considered. During implementation contingency/disaster recovery strategies and procedures must be considered and incorporated into product testing activities. During operations and maintenance contingency/disaster recover plans should be maintained and updated to reflect changes in influencing factors. Training programs should be developed and implemented to educate stakeholders on recovery procedures and to keep them abreast of changes. NIST identifies three high-level phases that should be considered when planning how post disruption/disaster activities should be executed. The Office of the Chief Information Security Officer (OCISO). Additional information on contingency planning can be found in the NIST Contingency Planning Guide for information Technology Systems. Information on risk management can be found in the CDC Unified Process Risk Management Practices Guide and the NIST Special Publication 800-30, Risk Management Guide to Information Technology Systems.